Elected to the Thirty-second Parliament for South-West Province at the by-election on 24 October 1987 held to fill the vacancy consequent upon the resignation of Hon. Victor Jasper Ferry. Elected to the Thirty-third Parliament for South West Region from 22 May 1989. Re-elected 1993, 1996, 2001, 2005, 2009, 2013 for terms commencing 22 May. Chair of Committees: 22 June 1993 - 27 May 1997. Parliamentary Secretary to the Minister for Education: 22 December 1999 - 16 February 2001. Deputy Chair of Committees: 23 May 2001 - 21 May 2005. Parliamentary Secretary to the Treasurer: 23 September 2008 - 22 May 2009. Parliamentary Secretary to the Minister for Commerce; Science and Innovation; Housing and Works: 23 September 2008 - 22 May 2009. Deputy Chair of Committees: 11 November 2008 - 22 May 2009. 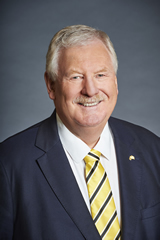 President of the Legislative Council: 22 May 2009 - 21 May 2017. Shadow Minister for Lands; Regional Development (until August 1991); Youth Affairs (from 17 June 1990) 7 March 1989 – 24 May 1992. Shadow Minister for Lands; Youth Affairs; South West; Conservation and Land Management (until 18 August 1992): 24 May – 24 November 1992. Coalition Shadow Minister for South West 24 November 1992 – 16 February 1993. Shadow Minister for Housing; Racing and Gaming: 9 March 2001 - 31 December 2001. Shadow Minister for Racing and Gaming; South West: 1 January 2002 - 20 March 2005. Shadow Minister for Education and Training: 20 March 2005 - 8 April 2006. Secretary of the Parliamentary Liberal Party: 9 May 2005 - 20 September 2005. Shadow Spokesperson for Science and Innovation; Biotechnology: 8 April 2006 - 23 September 2008. Member, Standing Committee on Government Agencies: May 1990 - 14 November 1996. [Chair 3 August 1993 - 14 November 1996]. Member, Joint Standing Committee on the Commission on Government: 17 August 1994 - 14 November 1996. Member, Joint House Committee: 18 March 1997 - 10 June 1998. Member, Standing Orders Committee: 22 June 1993 - 27 May 1997. Additional Member, Standing Committee on Estimates and Financial Operations (to consider the Estimates for 1990-91 and 1991-92). Member, Standing Committee on Procedure and Privileges: 31 May 2001 - 21 May 2005. Member, Standing Committee on Public Administration and Finance: 28 June 2001 - 21 May 2005. [Chair, 1 August 2001 - 21 May 2005]. Reappointed 26 May 2005 - 17 August 2005. [Chair, 9 June 2005 - 17 August 2005]. Member, Standing Committee on Public Administration: 17 August 2005 - 4 June 2009. [Chair, 24 August 2005 - 4 June 2009]. Chair, Standing Committee on Procedure and Privileges: 4 June 2009 - 21 May 2017. Deputy Chair, Joint Select Committee on Parole: 7 September 1989 – 28 August 1991. Member, Select Committee to Review the Legislative Council Standing Committee System: 26 June – 27 August 1997. Member, Select Committee on Native Title Rights in Western Australia: 17 September 1997 – 10 November 1998. Member, Select Committee on Native Title Legislation: 1 December 1998 – 10 December 1998. Member, Parliamentary Services Committee: 11 June 1998 - 10 January 2001. Chair, Parliamentary Services Committee: 4 June 2009 - 21 May 2017. Regional Seminar, Cook Islands/Sydney: 1990. Canadian Seminar, Ottawa Canada: 2003. Chair WA Branch CPA: 2009 - Current. Australian Regional Representative on CPA Executive Committee: 2011 - 2014. ExCo and General Assembly, London: July 2011. ExCo meeting, London: December 2011. ExCo meeting, Tonga: April 2012. 58th ExCo and General Assembly, Sri Lanka: September 2012. ExCo meeting, Cayman Islands: April 2013. 59th ExCo and General Assembly, Johannesburg: August 2013. ExCo meeting, London: April 2014. CPA Seminar, Dal as Salaam, Tanzania: May 2014. CPA Workshop on Codes of Conduct, Melbourne: April 2015. CPA Seminar, Dhaka, Bangladesh: May 2015. Port Moresby, Papua New Guinea: July 1995. Born 27 November 1949, Busselton, Western Australia. BEc. School teacher and youth education officer. South West Region covers eight districts, Albany, Bunbury, Collie-Preston, Dawesville, Mandurah, Murray-Wellington, Vasse and Warren-Blackwood.